When it comes to a new album by any of the “Big Four” bands, I’m always interested to see what they come up with after all these years. All four bands have set unenviable standards for not only every metal band that has come along since then but also inevitably themselves as well. By the benchmarks set by those seminal classics, we will – rightly or wrongly so – compare everything they do against those albums for the rest of their career. It’s just how it is. Now, I’m not going to get into which Megadeth album is the benchmark – because really, it’s Peace Sells ... But Who’s Buying? and there is no further discussion to be entered into – but it’s fair to say that the band’s output since the abortion that was Risk in 1999 has been inconsistent at best. Right up to that more than aptly titled album, it was easy to see why Megadeth’s stock went up in so many ways. With 1997’s Cryptic Writings, it peaked and came crashing down in a bloody mess with Risk. Since then, the band’s highlights have been easily been 2007’s United Abominations and to a lesser extent 2009’s Endgame. The rest have been consistently average at best. So, with album number 14 – titled Super Collider – in my CD player, what does this mean for one of metal’s biggest acts? Well, the short answer is consistently average. I think we’ve all seen some of the absolutely scathing comments and reviews of Super Collider out there and to be fair, it’s definitely not that bad, and it’s definitely not as bad as Risk. However, it’s certainly nowhere near as impressive as United Abominations in this post Risk era. I have to get this out of the way first though – the title track and Forget To Remember are easily the album’s weakest moments. They are weak sounding album-oriented rock thanks to their infectious choruses. These tracks that would fit easily alongside the more rock oriented material that Dave Mustaine and Co. churned out between 1992 and 1997. I could easily do without the terrible Don’t Turn Your Back... though. The album on the whole isn’t the train wreck that others have described it as. It opens up in stellar fashion with the excellent Kingmaker that reminds me of Sleepwalker (from United Abominations) or Dialectic Chaos (from Endgame) which were both excellent openers to their respective albums. The riffy Built for War is also a stand out track thanks to the off time feel and even Dancing in the Rain is decent enough if you can get past the somewhat average lyrics at times and it finishes reasonably well with a solid cover of Thin Lizzy’s Cold Sweat. Super Collider is certainly not without its flaws. There are some moments that truly make me cringe and wonder just what the hell Dave and Co. were thinking. Then, there are others that restore my faith in what they do. I’ve said it once and will reiterate it now – it’s nowhere near the abomination that Risk was. Any fears of that can be put to rest. To compare against the other end of the band’s musical output, it doesn’t compare in the slightest to any of Megadeth’s legendary first four albums. Where does that leave us then? Well, if this was not a Megadeth album, you could probably describe is as a slightly above average album. 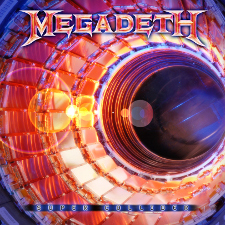 But given this is a Megadeth record, one can only say that Super Collider is another inconsistent effort that leaves very little last impression. Like I said early on, they set the benchmark high many years ago. Even though some of their more recent efforts were great efforts that really did capture some of the energy that we all expect from Megadeth, sadly Super Collider is merely a slightly above average album at best that is equally frustrating and enjoyable to listen to at the same time.